National Safe Place Network (NSPN) is pleased to announce March 17-23, 2019 as National Safe Place Week. The nationally recognized week serves to raise awareness about the Safe Place program, a national program which brings together businesses and volunteers to help youth in crisis. *This post is written by Youth Service, Inc.’s Runaway and Homeless Youth Program (RHY) staff. 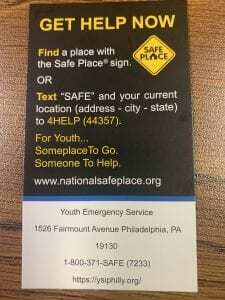 Local Safe Place sites throughout Philadelphia connect youth seeking help to the RHY program. A Drop Stop. You know those things that fill in the gaps so that stuff doesn’t fall between the seats in your car.…. Yeah, that’s how I think of the Safe Place program at Youth Emergency Service (YES). It’s such a small remedy for a huge problem. A remedy that makes so much sense; one that everyone finds valuable but may forget it is there. 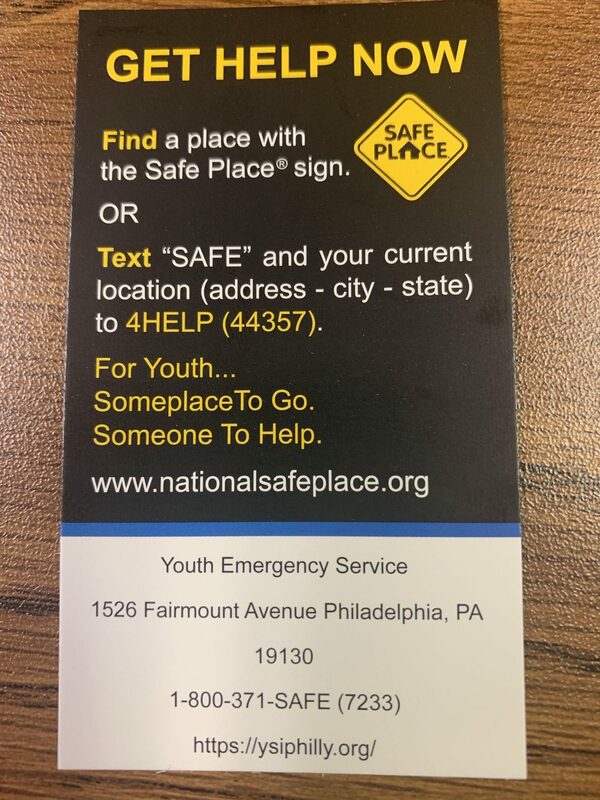 Safe Place connects youth to the Runaway and Homeless Youth program (RHY) at YES and fills in the gaps, making sure that young people don’t fall through. Similar to the Drop Stop, the emergency shelter provided by the RHY program serves as a safety net. The RHY program works to make sure youth have all the pieces they need to move forward or at the very least, know where to find them. Access to immediate housing is critical but it is not wholly meaningful without guidance and ongoing support. The RHY program is important because the staff are invested in what happens after youth leave. Program staff have served as work and school references to current and former clients. They have been sources of advice and advocacy for youth and families long after they have formally exited the program. Over the course of my time here, I have heard a lot of kids say YES feels like family. Remaining in contact with youth and families that have successfully weathered their crisis is proof that the collaboration of Safe Place and RHY staff, youth and families is a combination that can work for the best outcome and all the more empowering that they are doing well on their own. YES’s RHY program is important because it supports youth and families finding their independence to be successful!